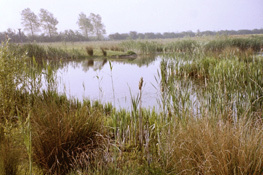 A conservation wetland at Church Farm. I have always been committed to professional development. My postgraduate training has included Working with Babies and Children, Trauma Work and Body Psychotherapy. I am a member of the disciplinary committee of the Craniosacral Therapy Association and am one of their accredited supervisors. I qualified in 2001 at the College of Craniosacral Therapy in London. My practice integrates Craniosacral Therapy and body psychotherapy. Craniosacral Therapy is underpinned by a knowledge of anatomical structures and physiological processes. Body psychotherapy pays attention to the body’s expression of emotional trauma through somatisation, where emotional pain may manifest as a physical symptom. I come from a farming family who have lived and farmed in Dunton since 1886. For 20 years I followed in this tradition as an arable farmer, with a particular interest in conservation, which I have maintained. In keeping with my farming background, I am passionate about growing and cooking my own food and raising my own animals. I have always been interested in alternative approaches to health. I have practised yoga, tai chi, chi kung, meditation and group work. My other interests include flying kites, surfing, world music and singing and performing sacred choral music.